Currently, as the world watches and cheers for their favourite athletes at the Winter Olympics, I find myself cheering for the Polish athletes, especially in the men’s’ Ski Jumping Competitions. 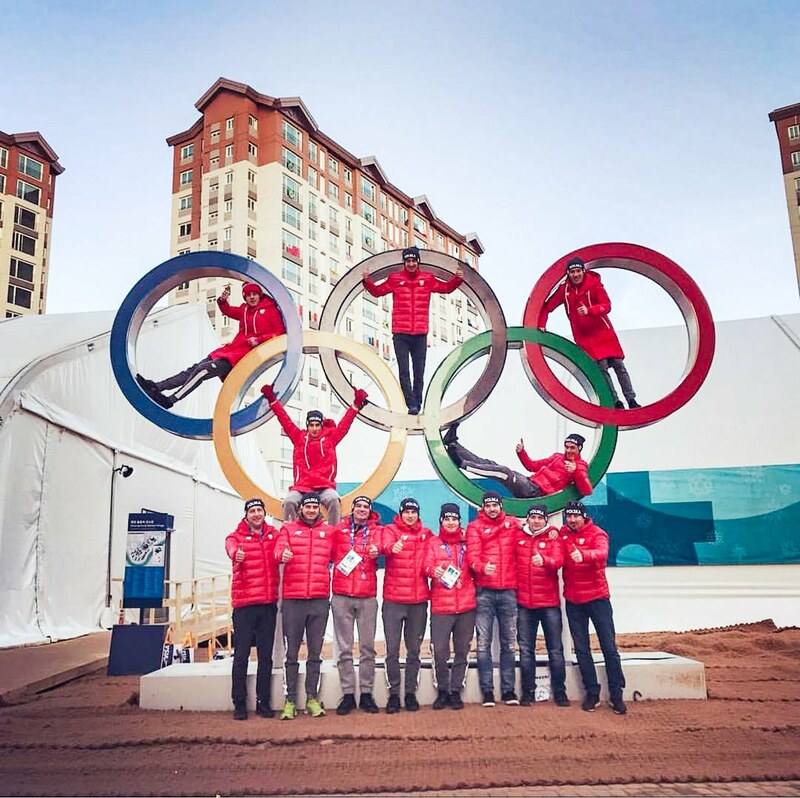 Over the past year, I have been following the FIS Ski Jumping Championship and the National Men’s Polish Ski Jumping Team. I have mostly learnt about them from my boyfriend and his family, who along with millions of other Poles love following this sport. These athletes make it look so easy and effortless, but mind you, it is an extreme sport! Ski jumping is a sport in which skiers go down an in-run, jump, and attempt to land as far as possible down the hill below. Ski jumping is widely considered one of the original extreme sports and it was one of the eight sports in the first Olympic Winter Games in 1924 in Chamonix, France. The speed of the skier is normally measured about 10 meters (33 ft) before the end of the takeoff; jumpers can reach speeds of 95 kilometres per hour (59 mph), on large hills and 105 kilometres per hour (65 mph) on ski flying hills. All this while trying to land like a graceful Swan! A favourite among Poles, the current World Ski Jumping Champion and Olympic Gold Medalist from Poland Kamil Stoch is one of my favourites. And at the time of writing this article, he just won his THIRD Olympic Gold Medal! He has a good personality and is very dedicated to his sport. I read somewhere, as a child, he even jumped off his parent’s roof, to practice. The other men in the Polish Ski Jumping team are also very good but sometimes finish on 2nd or 3rd places or even in the top 10 for that matter. And now, they can call themselves Olympic Medalists, as the team also won the third place in the team event. Since I have been following the sport, I thought it would be cool to go see them live in action in their home turf of Zakopane, which is just a short few hours’ drive from the city of Krakow. Zakopane is a very famous resort town on the foothill of the Tatra Mountains. It is a picturesque town with beautiful wooden houses and is a winter getaway for those who love to spend time skiing or doing other winter sports. They are also renowned for their thermal pools dotting the Polish mountainside. I have been to the area many times in the past and I love going there at any time of the year, as it always a perfect time to go. 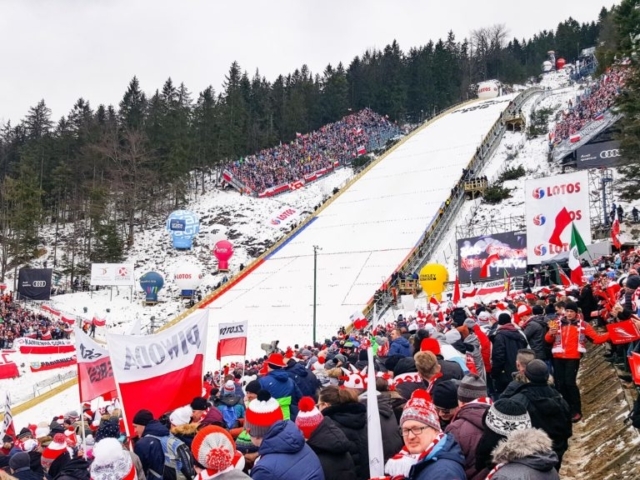 The Ski Jumping Championship’s final event was to take place in Zakopane Poland on the slopes of Krokiew mountain (1378 m), before the Winter Olympics in Pyeong Chang. So, my boyfriend and I decided to go experience it for ourselves. The Ski Jumping slope is – the biggest – of ski jumps built on the slope in Zakopane. It was opened in 1925 and from 1989 the ski jump bears the official name Wielka Krokiew im. Stanisława Marusarza. It is a regular venue in the FIS Ski Jumping World Cup. The capacity of the ski jumping stadium is roughly around 40,000. 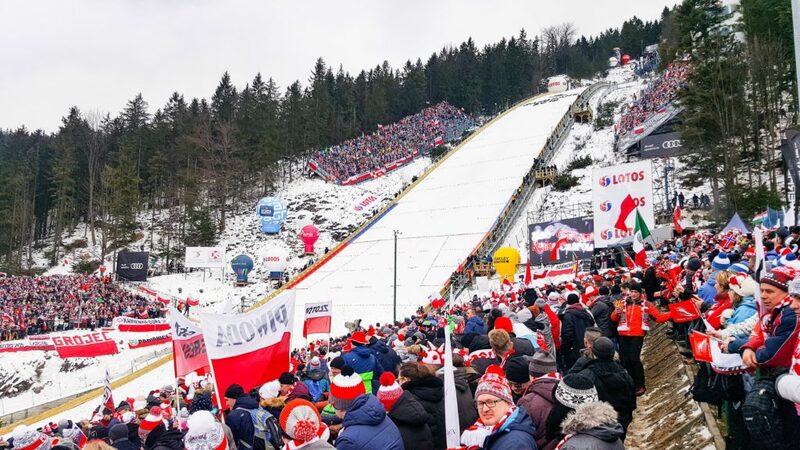 The event attracts huge crowds, not only the Polish Ski Jumping fans but also fans from around the world. You can see the hill even as you take a turn from the famous Krupowki Street in the centre of the town. The slope is a mere 15 minutes’ walk from the town and is walkable on foot. As the events take place on the hillside, there are no cars allowed close to the venue, but only those of the crew and participants. On either side of the streets leading up to the event are vendors selling Polish souvenirs flags, hats and vuvuzelas or horns. I think almost everyone had one of those. Also, there were typical Polish grills of sausages and other meats. The whole atmosphere was that of one huge summer BBQ party! The freezing cold did not dampen anyone’s spirit. I would say after watching the event on TV, it is even more exciting and fun to go watch it live in the cold as you have a rush of adrenaline participating with the crowds cheering for every participant. There is live music from the DJ booming after every jump, the MC rallying up the fans with fun jokes and games like the Mexican Wave, people holding up the Polish flags with names of the towns or villages where they came from, there are a few famous Polish artists/singers perform for the crowds in between the rounds. 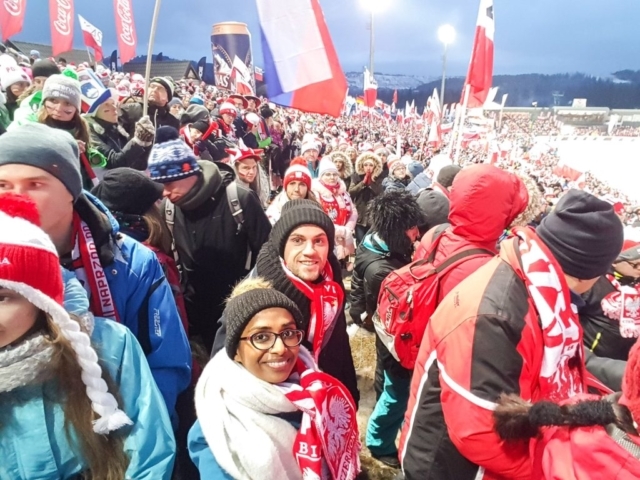 Even the Polish President Andrzej Duda was present as it would be Kamil Stoch’s chance for a victory in his homeland. In good humour and entertainment, the song Doo Dah was played for the Polish president. I really enjoyed myself despite the cold as it is quite different watching it on a TV. Unfortunately, no one from the Polish team won any place on the podium on that day due to changing conditions during the jumps. Crowd favourite Kamil Stoch, (and now 3 time Olympic Gold Medalist) even failed to qualify into the second round, jumping only a mere 108 meters. Stefan Hula of Poland could have won, but only came in 4th place just shy of a 3rd place win. It would have been nice to see at least one of the Polish team win, as it is usually a big deal to win an event in front of the home crowd. On our way back from the event, it seemed like the scene was set for a massive victory party but alas it was later cancelled. All in all, I had a great time at the event. 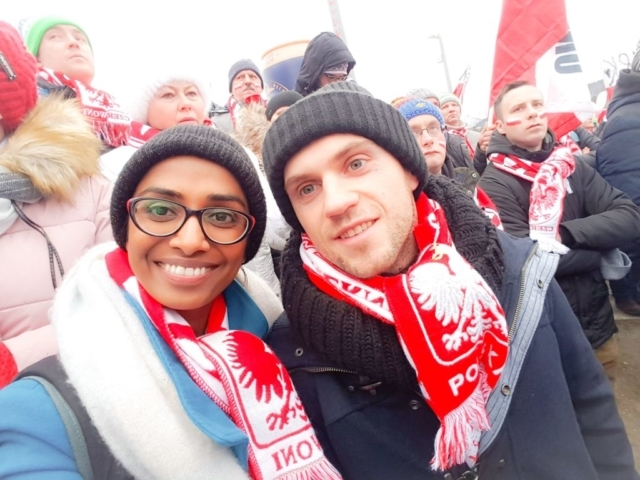 Polish President was also there to watch it live. I found myself having the best time, despite the fact that I hate being out in the cold for a long time. As this post goes to publish, the men’s Polish ski jumping team won third place at the Olympics in PyeongChang, and Kamil Stoch won his third Gold Medal in the individual event. A massive congratulations to these amazing athletes. I have learnt so much about this sport, something which I never even heard of back home in India. 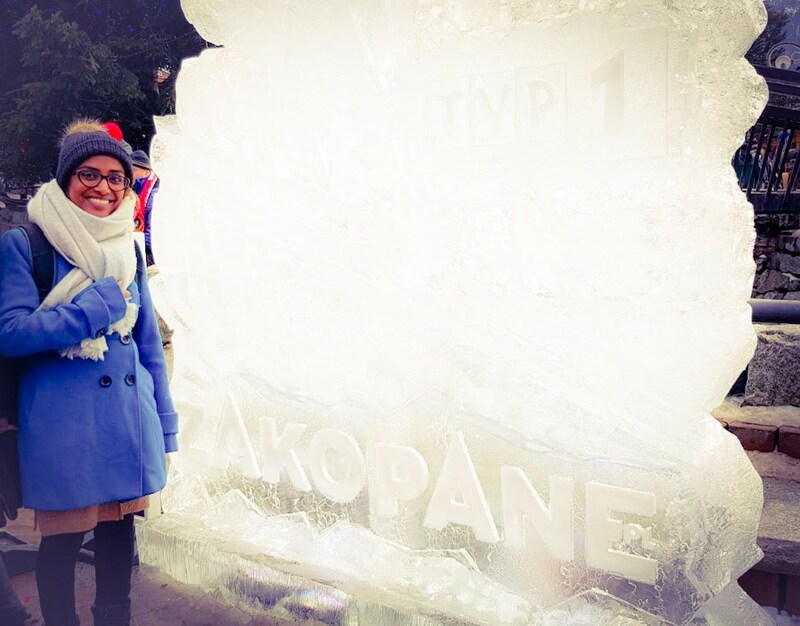 Just goes to show that travelling and living abroad can open up doors to new experiences. That sounds freezing, but awesome! What a fun way to celebrate and watch the olympics! What a bummer that Poland didn’t get on the medal stand It sounds like this needs to be tradition on every ski slope during the olympics. I LOVE the Olympics and have been really enjoying this sport! This was a really cool “behind the scenes”! Wow, I would love to visit at least once for this extreme sport. These athletes are so good and cool. The slope is so steep but they could control so well and ski down. The vibes are wonderful, people stay till the sky is dark, should be very cold. Thanks for sharing, I feel the joy of the occasion! Wow, this looks like it was such an amazing trip, and it’s so cool that you got to see Olympic Games live! Also, isn’t Poland just beautiful? It’s one of my favourite countries to visit. 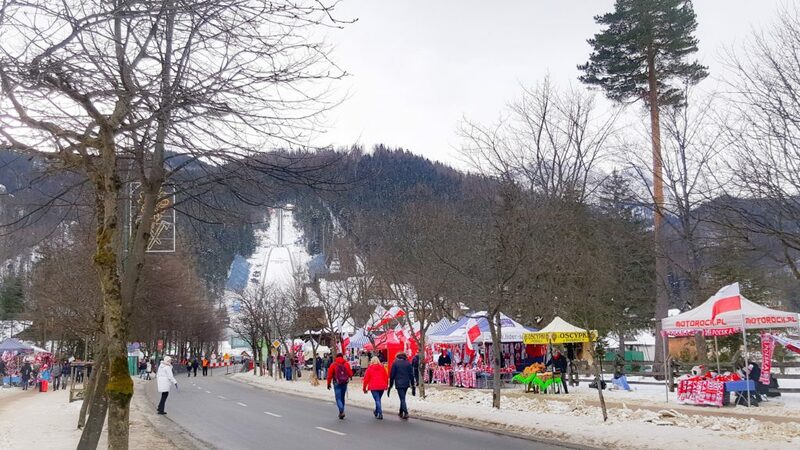 Attending the Ski jumping championships look like so much fun, I really hope you enjoyed the experience. It is lovely that you have found a sport to love in Poland. What a great opportunity to be able to see it in action, live action not through a screen. Truly amazing on screen, I can only being to imagine the feel good vibes of so many nations coming together. Wow, what a lovely experience! I would love to go here and watch the Ski Jump Hill Live Action. That’s something that I would love to watch. When I see this kind of live action in T.V. I do always watch this guys jumping around which is pretty cool. Hopefully I could attend Winter Olympics next year! this looks like such an awesome experience. I’m glad so were able to do it!!! It is so good to know details and history of this extreme sports Ski jumping. The event looks and sounds so good, I am glad you got to watch it and had a nice time. Zakopane looks like an amazing resort. You look so cozy in all of these photos. So fun! And it looks like there are so many things to do. I want to head to Poland someday! My husband and I have been following the Olympics from our couch, in VERY hot Florida, so I’m kind of jealous of the freezing weather. And I’m also jealous you’re right there!! How awesome. Enjoy!